You have arrived to the Best Vape Tanks 2018 Blog List E Cigarette Empire and we will steer you in the right direction when it comes to vape tanks for the New Year! Ok... Now that we got that out of the way, our main concern is to make sure you got the right gear when it comes to vaping for 2018. As we all know last year was a huge year for the vaping scene; more premium vape juice and hardware was released than any previous year! Now that both a huge accomplishment and milestone for the vaping community. We are even more excited for the New Year because based on the track record, on paper this is going to be the biggest year yet! Our goal, with the Best Vape Tanks 2018 Blog List, is to make sure you have some insight on what your next upgrade should be! To make sure that you have the right Vape Tank going into the New Year! All of the tanks that are featured on this blog list are carried here in the E Cigarette Empire warehouse. Matter of fact, most of the tanks on this blog list are being used by our employees right now! The TFV12 Prince Tank by Smok is hands down the best vape tank going into the New Year. 2018 will be filled with #handchecks that have a TFV12 Prince Tank on top of those beefy box mods. 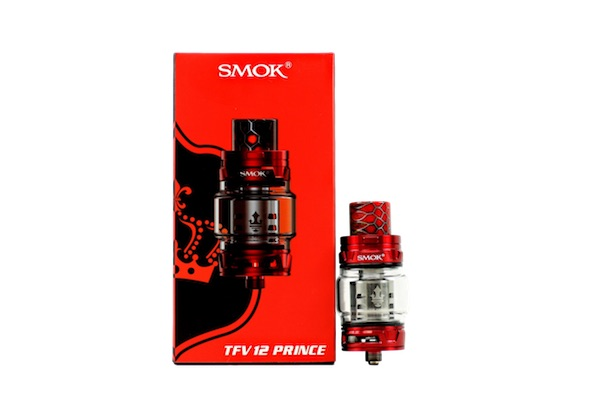 The TFV12 Prince Tank is one of the tanks on the market that can hold an absurd amount of e juice, 8ML to be exact! The best part about this tank besides the e juice capacity is stylish look of the actual tank itself. 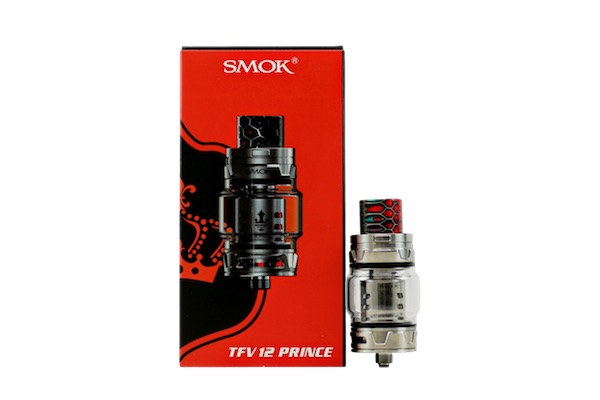 The TFV12 Prince Tank features a wide cylinder shape piece of glass that holds the e juice. As far as the actual tank itself it looks the same but with bigger airflows. The drip trip has been upgraded to a Cobra Drip Tip which has an awesome cosmetic design to it. Another new thing about the TFV12 Prince Tank is that the top sliding door is now activated by an unlock button which adds another security method against the most wanted suspect.. Leaking! If we here at E Cigarette Empire were to make any suggestions going into 2018 it would be that you need to get your hands on the brand new TFV12 Prince Tank! This is a major upgrade to any setup and this tank brings blowing clouds to whole other level! Besides the TFV12 Prince Tank, the TFV12 Cloud Beast King was the biggest vape tank release of 2017. This again is one of the most popular tanks going into the New Year for a number of reasons. The TFV12 is a literally cloud beast king. This is the first time in vaping history that a vape tank was able to reach the wattage range that this does. In return of being able to reach wattages near the 200’s, the cloud production is unreal along with the flavor production! The TFV12 Coils that were released with the tank and along the way have also stepped up their game as far as consistency goes. Every coil is made with pure craftsmanship and helps with cloud/flavor production along the way! Like the TFV8, the TFV12 Cloud Beast King comes in numerous amounts of different colorways allowing for the style factor of this tank to raise high in the ranks! The TFV12 is one of the most popular tanks in the industry including here at E Cigarette Empire and it was the award winning vape tank for Best Tank of 2017. With us going into the New Year not much has changed about this monster! The TFV8 X-Baby Tank by Smok is not only one of the most loved and popular tanks in the vaping industry going into 2018 but it is also a groundbreaker for Smok tradition. 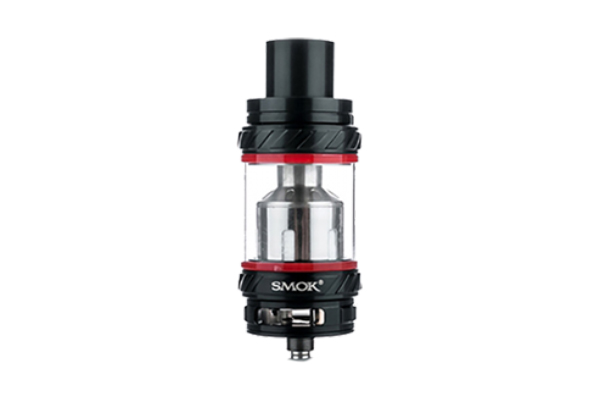 Since Smok has birthed in the vaping scene, the have been known to produce badass tanks with an adjustable bottom airflow. This is what they are known for! The TFV8 X-Baby Tank is the first time in Smok history that they have released a vape tank that features a top airflow technology and it is wonderful! From the very start, these tanks have flown off the shelves here at E Cigarette Empire which proves this tanks are extremely popular. The TFV8 X-Baby Tank has a 4ML e juice capacity which is gigantic considering the small size of this piece of hardware. It still uses the swivel top lock system except the airflow is located right under it. Each airflow slot is about 16mm by 2mm and takes in a ton of air allowing for tons of clouds! If you are looking for a small and powerful vape tank then the TFV8 X-Baby Tank is our recommendation to you. It will bring your handcheck up a couple of notches for 2018! They come in multiple colorways for your stylish wants and needs! The NRG Tank by Vaporesso is another amazing state of the art tank that is very popular with the start of 2018. Something that makes the NRG Tank by Vaporesso stand out from the rest is the mesh drip tip. It features a mesh shield inside the actual drip tip that stops any spitback of e juice from inhaling. No more nasty liquid flying into your mouth when you are vaping! The NRG Tank also features a swivel top technology that makes it easy for on the go vaping as well as easy on the go refills. This vape tank comes in four different colorways that include Black, Red, Silver, and Blue. Along with an awesome top swivel system and a mesh drip tip that prevents spitback, the NRG Tank features two big bottom airflow slots that allow for maximum cloud production. The two airflow slots are adjustable so you can adjust how much flavor you would like vs how much much clouds you want to chuck! The NRG Tank is sold separately but is also including in the Vaporesso Revenger Kit as well as the Revenger X Kit. The Revenger Mini Kit features a smaller version of the NRG Tank called the NRG SE Tank. Last but definitely not least is the Gnome Tank by Wismec. This tank is a heavy hitter and stands in the ring with any vape tank in the world. They come with the new RXGen 3 Kits by Wismec which is where its notoriety was gained. The Gnome Tank is a small but heavy duty vape tank that has multiple features that disables all e juice from leaking. It holds about 4ML of vape juice which is just enough to get you going through the day! The Gnome Tank also features a top swivel design that makes it very easy for on the go vaping as well as on the go refills. The bottom airflows allow for maximum flavor and cloud production so you will always be blowing the biggest clouds out of all of the friends. How cool. The Gnome Tank uses the all new WM coils by Wismec which are engineered to produce a lot of flavor but at the same time making sure your coil lifespan is long. No more vaping for a day just to find out your coil is already burnt out. If you ask me what vape tank you should get for the New Year, the answer is simple my friend. Your next handcheck should include the Gnome Tank by Wismec or one of these easy to use vape tanks in the Best Vape Tanks 2018 Blog List!